(PRLEAP.COM) April 11, 2019 - Xcellimark is the first Digital Marketing agency in the United States selected by the Digital Marketing Institute (DMI) to offer its globally-recognized accredited certification courses in digital marketing. The Orlando-based Digital Marketing agency's partnership with DMI provides a unique opportunity for individuals, companies, and active-duty and military veterans throughout North America who seek to improve their skills or embark on an exciting, creative career path. The online Digital Marketing courses are created in collaboration with industry experts representing highly-respected companies such as Google, IBM, Facebook, Coca Cola, Microsoft, HubSpot, LinkedIn, Twitter, and more. Representatives of these companies serve on DMI's Global Industry Advisory Council (IAC). Xcellimark's almost two decades of real-world digital marketing experience brings a unique perspective and added value to DMI's Digital Marketing degree programs. Xcellimark professionals are available for weekly online office hours to provide individualized support while students are taking the Digital Marketing courses. Upon completion, Xcellimark will help students apply these new skills to their specific business or job. Those working towards certification through Xcellimark have access to the Xcellimark online network of staff and students to work collaboratively, and graduates can have works published and promoted on the Agency's blog. This is an exceptional opportunity to gain valuable knowledge and practical experience with an internationally-recognized Digital Marketing certification. 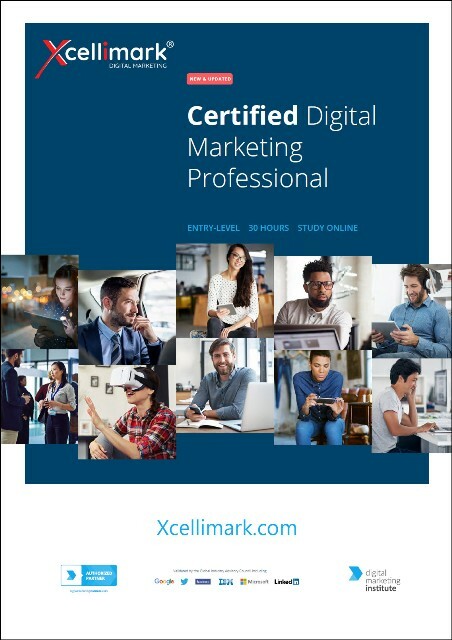 "The Certified Digital Marketing Professional course is perfect for business professionals who want in-depth knowledge about digital marketing in order to improve ROI, current marketing personnel in search of a career boost, job seekers wanting to increase their value, and active and veteran military service members wanting to expand career opportunities," stated Scott Lambert, President of Xcellimark. "In fact, active and veteran military members receive a 15% discount to help them in their transition to a new career." In recognition of its new partnership with the Digital Marketing Institute, Xcellimark is offering potential students a no-cost online assessment of their digital marketing skills. The Digital Marketing Diagnostic Assessment takes just a few minutes to complete and allows individuals to see how they compare with others in their industry. More information is available at Xcellimark.com or by calling their Orlando, FL office at 407-678-3062. Xcellimark is an award-winning Digital Marketing agency that helps professionals grow their company and their careers through Digital Marketing consulting and training. As a Partner of the Digital Marketing Institute, Xcellimark offers accredited interactive training programs designed to help boost your career, grow your company, or prepare you for a positive career change. You can also hire Xcellimark to create and manage your company's digital marketing for you. Xcellimark is A+ rated by the BBB, is the recipient of 17 awards, are certified HubSpot trainers, a HubSpot Gold partner, and a contributor and member of the Forbes Communications Council. DMI is a global digital marketing professional learning and certification body with over 27,000 alumni members and partners in over 100 countries. Founded in Ireland with a U.S. office in Dallas, it is backed by Spectrum Equity, a leading U.S. based growth equity firm. Customers include IBM, Black & Decker, Microsoft, PwC, University of Utah and University of Vermont. DMI's Global Industry Advisory Council, consisting of leaders from Coca-Coca, Facebook, Google, HubSpot, LinkedIn, IBM, IAB, WPP and more, provides input to DMI's certification programs and industry trends.